This entry was posted in Elgin and tagged downtown neighborhood association, Elgin. Bookmark the permalink. Trader Joe’s, an internet cafe. I come downtown for lunch every now and then–if an antique shop such as Scentimental Gardens of St.Charles and Geneva were next door to one of the downtown restaurants, I would patronize them as well. I also take my grandchildren to Hemmons for plays–a nearby ice cream shop would be nice. It seems to me that adding a business that complements a business that is already there would be the most successful. Completely agree with your last line about complementarity – that was a key point of the session: finding businesses that “fit” with each other and can attract similar crowds. Sidewalk cafes make me happy. I’m curious to see how the riverwalk progresses – I heard Chooch’s Pizza is planning to have an outdoor, riverwalk-facing seating area. And a Trader Joe’s would thrill me! Have you been in Elgin Antiques & Uniques and Two Doors Down? They’re both on Chicago Street and have interesting, ever-changing selections that are fun to browse. Oooh…I like the wine shop possibility. You might also pair video games with the comics/collectibles idea. A Gamestop might work very well, too. The closest one is in Streamwood, and beyond that, Hoffman Estates. A wine shop would be fabulous, I agree. I hadn’t thought about a game shop, but that definitely makes sense, especially if it draws teens/20-somethings with disposable income to spend at restaurants and such. Come on down sometime, Amy – we’ve got a couple of really cute “stuff” stores, like the Elgin Antiques & Uniques mentioned above and SpaceTaste Gallery. We can do lunch. The Half Price Books is an interesting idea. 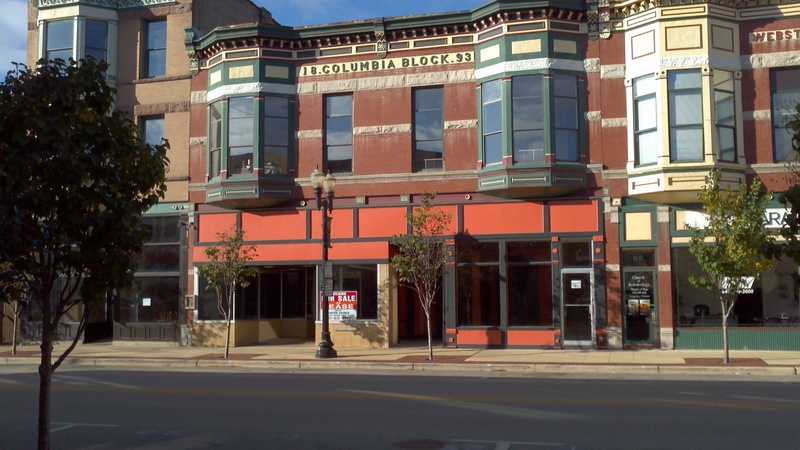 We have one great bookstore downtown already – Elgin Books & Coffee – but some of my fondest memories of Hyde Park are wandering the row of bookstores on 55th Street. I’ve heard similar things about call centers, which raises some interesting questions about types of downtown patrons vs sheer numbers. I can definitely agree on some of the ideas on this list. There have been many instances where I wished downtown Elgin had some of the listed businesses above. One in particular stands out. My father and I restore, rebuild, and customize bicycles as a mutual hobby for the last two years. Upon starting this hobby we noticed that Elgin too became more cognizant of bicycles and have made strides to become a more bike friendly city via bike lane implementations and community bike related events. But as an avid bicyclist, albeit I enjoy the infrastructure that downtown Elgin possesses for bicycle commuting, I get a bit lonely on the road  I don’t see very many other bicycle commuters using their bicycles for utilitarian purposes which is depressing. We feel one very large reason for that is downtown Elgin’s lack of a bike shop. We have toyed with the notion of starting one but it would remove our “hobby mentality” into a business. With that comes a lot of changes and we fear that working on bicycles would become less fun and more, well, work. One idea we did like was the idea of a bicycle co-op similar to the co-ops that exist in Chicago. A place where a novice and experienced bicyclist can work on their own bikes together and teach others how to repair, work on, and maintain their bicycles. It would allow Elgin to form an actual bicycling community and would help promote cycling for all purposes, not just recreational. Id like to help remove the stigma that bicycling is only for children, DUI offenders, the poor, or athletes. Biking for utilitarian purposes promotes an image that Elgin is a tightly knit community. Seeing someone transporting light groceries via bicycle allows others to know that there is a local convenience/grocery store. Bicycling within Elgin’s downtown sector will ultimately make Elgin more localized and fun. I recently visited Madison, WI and fell in love with their downtown area. The infrastructure reminded me of Elgin but the lushness of commerce and acceptance of bicycling made me envious. I wish Elgin could become a thriving, fun, and community based city. Now, another issue I have with downtown Elgin is this advent of these mega bars. These bars that try way too hard to please every demographic Elgin has. These bars that simultaneously have an active dance club, a band playing, but also try to be a family restaurant. These venues overexert themselves and frankly, become annoying. They ultimately fail and another mega bar tries to fill the void. I really miss the days of Prairie Rock, namely for the good food and great micro brew. Its amazing how the only micro that I am aware of in the vicinity of Elgin is Emmett’s in East Dundee. What happened to the micro brew trend? Please bring it back!